NG Bailey has been awarded a £15m contract at Birmingham City University. The work – the second phase of the faculty’s on-going city centre campus development – comes on the back of the family-owned business successfully completing the first phase. In a fully collaborative approach, NG Bailey’s Engineering, IT Services, Offsite Manufacture and Facilities Services divisions will be working together to supply Birmingham City University with a complete design, build, operate and maintain contract. The company will provide full mechanical, electrical and plumbing services to the university including systems integration, IT cabling and active kit installation. Once work is complete, NG Bailey’s Facilities Services division will maintain the building, as part of a three-year contract. “Phase one of this job to create The Parkside Building was an excellent project for NG Bailey, as it gave us an opportunity to showcase the benefits of BIM on a large scale and I am thrilled that we have been selected to complete phase two. 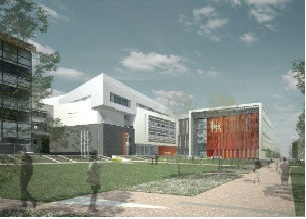 Work completed on the Parkside Building – home to the University’s Birmingham Institute of Art and Design and its media school – in June 2013. NG Bailey worked alongside main contractor Willmott Dixon, to provide a full M&E package to the new building, along with an extensive IT solution, which was completed by the company’s specialist IT Services division. Phase two of the project, adjacent to The Parkside Building on Birmingham’s Eastside site, is due for completion in May 2015.